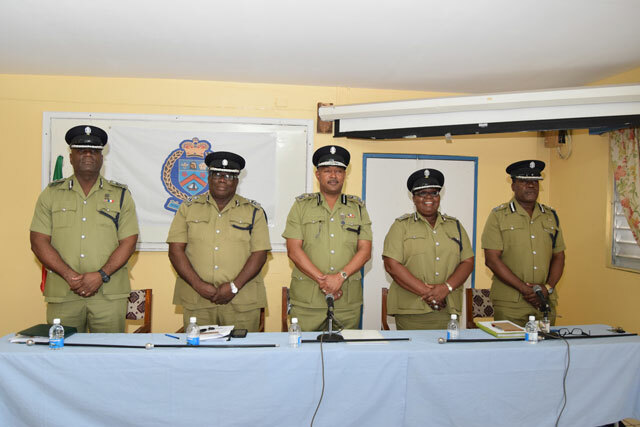 Basseterre, St. Kitts-The High Command of the Royal St. Christopher and Nevis Police Force are committed to holding officers who run into trouble with the law accountable for their actions. Speaking at a Police Press Conference on Thursday, Commissioner of Police Ian Queeley told members of the press that one of their concerns was that police officers were not being held accountable for their actions. “We were faced with several cases against our officers for failure to perform their duties and other violations in breach of violations of various laws,” Queeley stated. The Commissioner stated that to ensure earliest deposition of these cases each of the Assistant Commissioner of Police have been assigned as trial officers in each of the divisions. He further disclosed that both incidents were fully investigated and the files have been forwarded to the Office of the Director of Public Prosecution for review. Queeley added that four of officers were charged with criminal offences to date and one of those cases have been disposed of with the officer involved being dismissed from the organization and receiving custodial sentencing from the court. Andre Mitchell Assistant Commissioner of Police when question as to why it took eight months to investigate one particular case involving a police officer stated the length of investigations varies. He added that during investigations they aim to ensure that when the matters are presented to the court the investigations are solid and can make the conviction. These revelations comes the same week when Officer Constable Delroy Stapleton had been charged with “inflicting grievous bodily injury with a weapon” and “unlawful discharge of a firearm” in connection with National track and field athlete Timoy Henry. Henry was shot in the neck on the strip when the officer opened fire into a crowd where an altercation had taken place. Henry was not involved the altercation but was left with his left hand immobile following the incident. Also being at the press conference police addressed a pornographic vide involving a female minor that has been circulation on social media in the past week. Queeley stated that the Police Force frowns on the dissemination and circulation of Pornographic Material and are investigating the matter. He however indicated that when the matters a circulated on Facebook it presents challenges for the police force during investigations.